The number of children cycling to school alone has rapidly decreased over the past few decades; understandably this is largely because parents worry about traffic danger. In “Reported Road Casualties Great Britain: 2012” published by the Department of Transport, of the 118 cyclists killed on Britain’s roads in 2012, 13 were children. Also of the 3,222 cyclists seriously injured, 311 were children. However, according to the British Medical Association, the health benefits of cycling outweigh risks by 20:1. We live in a society which rightly wants to protect children from harm, but neither is it healthy for children to always remain in doors for fear of injury. If you teach children about road safety, there is no reason why children can’t enjoy the freedom of cycling. With 10% of the UK’s population of 10 year olds being classified as clinically obese and 29% as overweight, promoting activities such as cycling for children is becoming ever more important. It being child safety week, this week it is important to highlight the risks of child accidents and how they can be prevented. When it comes to cycling, following some basic rules can help keep a child safe and prevent injuries and accidents. Although wearing a helmet for adults is a matter of personal choice, hospital data shows that 45% of child cyclists suffer head injuries. Therefore, in my view, it is important that a child wears a helmet, particularly so for young children as their skulls are fragile. A child’s helmet should fit properly with little or no wobble when fitted. The helmet should be positioned firmly on the head, with the chin and back straps meeting on the jaw, below the earlobes. The chin strap should be firm but not too tight. If the helmet tips sideways, backwards or forwards it is too loose. The outside of the helmet (shell and polystyrene) should be in good condition and not cracked or damaged. If a child falls and puts the helmet to the test, be sure to replace it as the helmet may not work as effectively afterwards. Children need to ride on a bike that is the correct size. Make sure the seat, handlebars and wheels fit tightly. Check and oil the chain regularly and check the brakes to be sure they work well and aren’t sticking. Check the tyres to make sure they have enough air and the right amount of tyre pressure. Make sure a child is wearing the right clothing and that nothing will get caught in the bike chain, such as loose trousers, backpack straps or shoelaces. Wearing bright clothes and putting reflectors on a child’s bike can also help them stay safe by making them more visible to drivers. Daytime riding is the safest, so it is best if a child avoids riding at dusk or later. Teach a child balance, turning and signalling skills away from traffic, then take them riding on quiet streets initially to improve their traffic awareness. Point out any hazards to them and help them choose good places to ride. You can help them stay clear of busier roads and work out quieter routes by using the Bike Hub’s online route planner. Teach them to keep to the left side when riding in traffic, at least one metre from the kerb or parked vehicles. Encourage children to ride predictably, in as smooth a line as possible. They should avoid cutting in and out of parked vehicles. Exiting driveways is one of the most dangerous road scenarios for children. Children under the age of ten are particularly likely to speed out of drives and side exits without paying adequate attention, so teach a child to exit driveways carefully and be wary in these circumstances. Can children cycle on the pavement? Cycling on footways (a pavement at the side of a carriageway) is prohibited and is punishable by a maximum fine of £500 if the matter goes to court. However, it is more usually enforced by way of a Fixed Penalty Notice which carries a fine of £30. The legislation makes no exceptions for children’s cycles, so even a child riding on a footway is breaking the law. However, the age of criminal responsibility in the UK is 10, so anyone under this age cannot face prosecution and can cycle on footways without fear of redress. With a huge range of bike seats and trailers it is easier than ever to cycle with young children. Use one of the special child seats readily available from good cycle dealers and child care shops that conform to the British Standard for Child Seats for Cycles (BS EN 14344:2004). Seats which fulfil these requirements are designed to carry children who are between 9-22kgs (approximately 9 months to 5 years of age) in weight. Make sure your child is within the weight range of the seat you choose. Check that the child can sit comfortably in the seat and check that the seat is suitable for use with your type of bicycle. A harness is essential and seats that conform to British Standards must have a good restraint system, with a child proof quick release buckle, to hold a child in place. Most injuries suffered by children riding in child seats happen when children’s feet get caught in the spokes of the wheel. So never use a seat without footrests to act as a shield between the child’s feet and the wheel. Other good features are a high back, hand rests and wrap-around construction. Seats which are fixed to the front of a bicycle and are attached to the handlebars reduce the bicycle’s manoeuvrability and can affect steering and balance. The child (and sometimes the seat too) can also be flung forward when the rider brakes. If you use a seat that sits onto the front of your bike, make sure it does not attach in any way to the handlebars, and that it fits between the rider and the handlebars are better. Do not fit one in front of the handlebars. Alternatively you can carry your child in a bike trailer. With these you tow your child behind you in an enclosed carriage. They have two bicycle type wheels and a long hitching arm that fastens to your bike. The child is seated and strapped inside the zipped, weatherproof and ventilated compartment, which has fabric or plastic windows so he or she can see out. The age range is wider than with a seat and they can carry more than one child. They are more visible and wider which encourages drivers to give you room. If you should fall the carriage should remain upright, and even if not, the child is protected by a roll cage. As stated previously, many parents are reluctant to let their children cycle to school. In a survey of 814 parents commissioned by Halfords, only 17 % said their child cycled to school, citing dangerous roads as their chief concern. If all children completed cycle training in school, it may encourage parents to allow their children to cycle. Also it is likely that a child will have to cycle on a road at some point, so compulsory training in schools could prove vital in helping to teach children to cycle safely and help prevent accidents. The national curriculum currently requires all children to be taught to swim “competently, confidently and proficiently” over a distance of at least 25 metres. 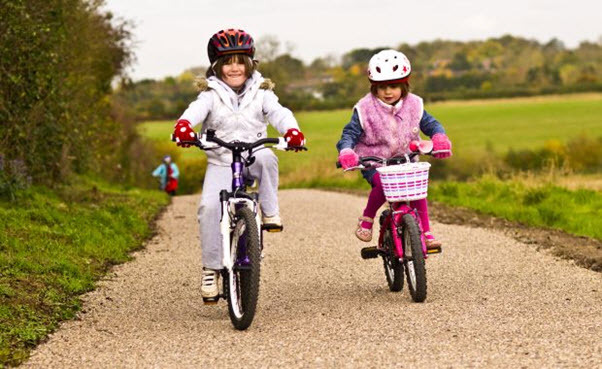 In a poll by You Gov, 82% of the people surveyed said they would support a similar requirement on the national curriculum requiring all children to be taught to cycle competently, confidently and proficiently on the roads. Cycling should be encouraged as it is green, healthy and fun and helps children to become independent. You can also enjoy cycling as a family and you don’t have to wait until your children are old enough to ride themselves with the wide selection of child seats and trailers which are available. Teaching your children some basic safety rules can help keep them safe and cycling can be an activity that is enjoyable for everyone – so get cycling!